I realised with a surprise at the weekend that we’ve never featured a vintage Husqvarna motorcycle. One tends to associate the Swedish brand (est. 1903) with its all-conquering motocross machines from the 60s and 70s, but the earlier models are worthy of attention too. Like this beautiful, monochromatic 496 cc V-twin from 1935, a racing bike that I’ve oft lingered over. To my eyes, it looks as good as any vintage Harley or Indian from the pre-War era, and the white paint is perfect—Husqvarna always seemed to give its machines great colors. This one was no slouch, either, with 41 bhp and a dry weight of only 124 kg. That equated to a top speed of 119 mph, a sensational figure for the 1930s. Today, the Husky is safely ensconced in the Deutsche Zweirad- und NSU-Museum in Neckarsulm. 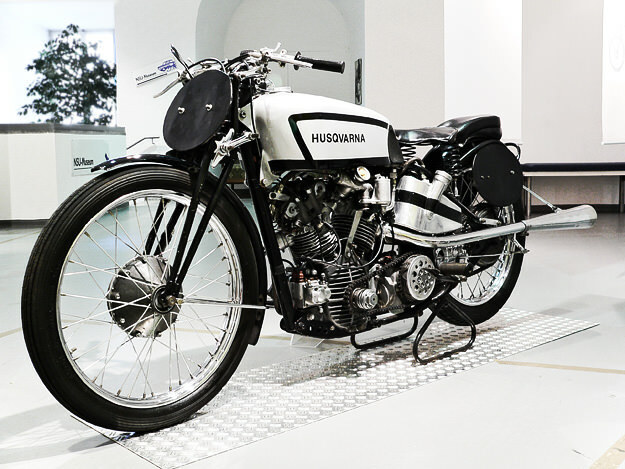 It’s one of the world’s lesser-known motorcycle museums, but worth a visit if you find yourself in southern Germany.